Sloths are one of the slowest moving creatures on the planet. They rarely get more than a few metres per minute, therefore aren’t equipped to jump out of the way of your vehicle. 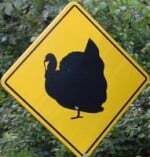 Keep an eye out for them if you see this sign. 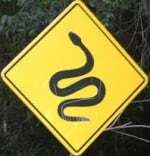 This Guatemalan sign warns of snakes on the road. If you do happen to run one over, don’t get out to investigate whether it is dead as it could give you a fatal bite. 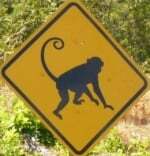 Monkeys can be crossing the road if you see this sign. They may be inquisitive if you stop your car. Look out for them in troops. This is the common opossum, which is widespread from Mexico through to down to the northern parts of South America. 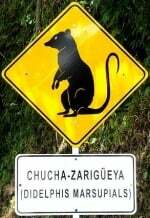 It has a huge number of names as you travel around the continent (despite most of the continent speaking Spanish, but it is commonly known as chucha, which you can see on this sign, or by its Latin name, Didelphis Marsupialis: guazalo, mbicuré cangrejero, zarigüeya cangrejera, runcho, rabipelado (in Venezuela), faro (also in Venezuela), zorro marsupial pelón, zorro cola pelada (in Nicaragua) and zarigüeya común americana. Coatis, also known as coatimundis, Brazilian aardvarks, cholugos and other names, are the size of a large cat and are common from Mexico down to the south of Brazil. The Ocellated Turkey is found primarily in the Yucatan Peninsula and is a large bird up to 5kg. It’s found only in Mexico and the northern parts of Belize and Guatemala, and is near-threatened. Llamas are large, primarily domesticated animals related to camels. They’re found in the Andes. 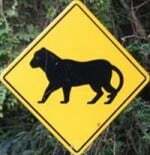 Jaguars are found in forested areas and this sign is from Guatemala. 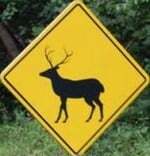 Deer can be found in some areas. 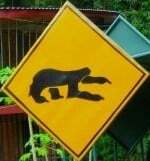 This is a Guatemalan sign.